Tossed Salad - The Chip's Challenge Wiki - The Chip's Challenge Database that anyone can edit! 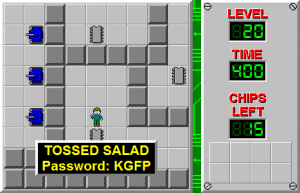 Tossed Salad is the 20th level in Chip's Challenge 1. Tossed Salad is an intentional busted level as it appears in the Microsoft version - there is no socket, meaning there is no need to collect any of the 15 computer chips. In Lynx, the level was exactly the same, and at that point it was likely a designer error. For MS, the bust was left in. The balls just above the teleport will eventually clone a block that blocks the path, but Chip will avoid this by simply not collecting the chips. Teleport to a tank ladder and observe the pattern: the toggle wall and the tanks swap alternately, each every  but  apart from each other. Watch carefully for the monster order of the tanks, because the first, third, fourth and fifth switch instantly, and the one that's below the red key must be passed very quickly in order to beat the toggle wall underneath. Missing this will cause a delay of one full tank cycle worth , which eventually adds up to  minus  while waiting for a pink ball; this net delay of  removes 340 from contention. Note that the fire boots that are encountered after the chips surrounded by fire are still needed (there is fire later on) even though the chips are not. The other more challenging section is the tank ladder in front of the yellow key. 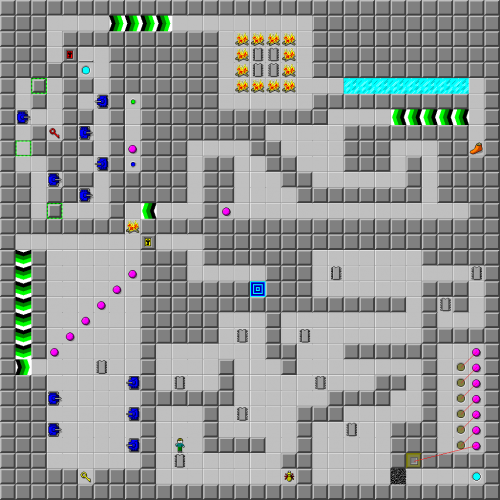 After sneaking behind the equalizer and through the fire and force floors, stand L away from the chip; wait  before dropping down to the key and  before bolting north through both the tanks and the pink ball elevator without further waiting. But the challenge turns out to be harder than Chip thought. The Bit Busters want it that way - to keep out lobotomy heads. This page was last edited on 19 April 2019, at 02:39.